Another Kerry town. As enjoyable as I find it to paint the mountains and coast of Kerry, there’s a fair few towns down there I also want to paint. 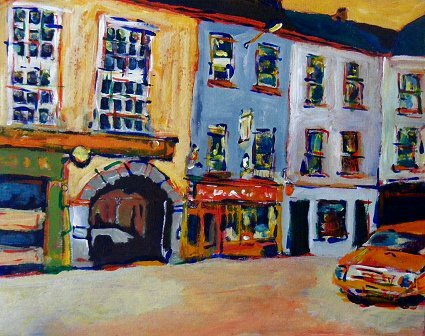 I currently have 2 paintings of Sneem in progress and previously have painted Killarney and Listowel along with an earlier version of this Tralee view. The painting Tralee II is now SOLD. Tralee II is part of the End of Year 2009 online sale of paintings, which has launched with paintings at half-price and FREE shipping worldwide until Christmas Eve. Loads of new paintings are being rolled out on my personal blog Bicyclistic in batches. To see announcements first follow me on twitter.